Wesley comes aboard for a visit and encounters a crew that is falling under the spell of an addictive game. Before I start, let me just say, in the interests of full disclosure, that this is my wife's favorite episode. She used to have a fascination with Wil Wheaton (I have no explanation for it), and she just loves him in this one, for whatever reasons. Maybe she just thinks the young love between him and Ashley Judd is cute. I'd rather not speculate any further than that, because gross. Man, Riker's quite the player this season (pun intended). The alien chick's eyes are freaky up close. Risa has this reputation for being a great place to relax, but every time somebody from the Enterprise goes there, messed up things happen. First, Picard is visited by aliens from the future intent on stealing a powerful weapon (in "Captain's Holiday"). Then, in "The Mind's Eye," La Forge is kidnapped and brainwashed by Romulans. According to the DVD special features, Marina Sirtis, the actress who plays Troi, hates milk chocolate and was, at the time of filming this episode, worried about gaining weight. When you see Troi enjoying the chocolate sundae in this episode, it's fun to know that the actress hated the experience and was spitting it out into a bucket after every cut. 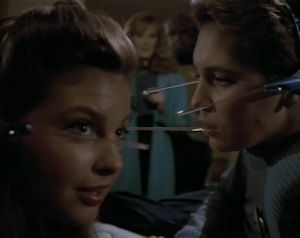 When Dr. Crusher tells Wesley that "this was meant for you," in reference to the game, it reminds me of "Conspiracy," when the infected admiral tells Riker (whom he thinks is also infected), "you were meant for the doctor." Come to think of it, this episode and "Conspiracy" have a lot in common, thematically. They're both kind of a play on Invasion of the Body Snatchers. It's ironic that a story that is essentially about video game addiction (impressive since it predates World of Warcraft) features all the adults playing a game while the younger characters are trying to get them to stop. How does Geordi play the game? It's another chase on board the Enterprise, this time with Wesley. Unfortunately, Wesley fails where Roga Danar and Data both succeeded (in "The Hunted" and "Brothers," respectively). Wesley's wiley, but he can't compete with a genetically engineered super soldier or an android. I'm glad that's how it works out, because Wesley outfoxing the entire crew would have been a little hard to swallow. Then again, you could argue that he won, because he had his ace in the hole with Data (a good twist, incidentally). Number of episodes in which a member of the crew is subverted by an alien influence: 17. This is an interesting little story that should, for all intents and purposes, be hokey. However, it works because it includes a disturbingly sexual undercurrent (as exemplified by it starting on Risa with Riker's obvious recreational activities, the game itself with its inserting things into undulating tunnels, Troi's extremely sensual description of eating a chocolate sundae, and even the phallic look of the alien vessel) and it works because it comes across as an authentic way to explore Wesley's character. Wesley has obviously grown since we last saw him, as he is more laid back and more comfortable around girls. His relationship with Robin Lefler feels natural and not too forced, and it is obvious that he is maturing into a more sexual person. Above all, the way the game sparks his curiosity so that he wants to take it apart before playing it makes perfect sense given what we know about him as a tinkerer, meaning that the plot develops organically and is driven by character. It's good that the writers refuse to forsake those who have left the show by bringing them back like this from time to time for stories that do them justice.